The Color, the bird, the old windmill! WOnderful! I sometimes struggle with the deep red and oranges through to yellows of sunsets and sunrises especially when it comes to printing the results. You seem to have nailed it perfectly. There will be more orange sunsets, as the smoke will not be going away any time soon. Looks like the sky is on fire. Beautiful! Brilliant, so sad its magnificence has been created by bushfires. Amazing, haven't seen such a red sky for a long time. Only red because of the smoke unfortunately. Do you have fires because of drought? Yes, the bush is very dry. There are currently 14 fires burning in the Victorian Alps. Most started from dry lightning weeks ago, the biggest is 80,000 hectares. 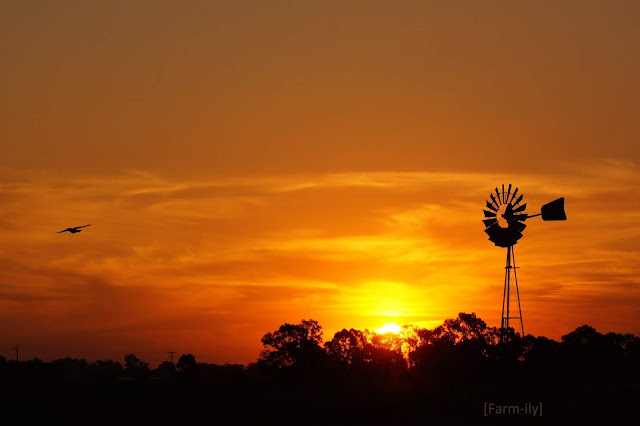 We are all just hoping and praying for some good Autumn rains.